Mussels are one of my husband's favorite seafoods because it always makes him think of our romantic trip to Amsterdam, Bruges and Brussels BC (Before Children). Our favorite part of the trip was sitting in an outside square in Brussels, people watching and eating large pots of steaming mussels while drinking Chimay beer. Monday was my husband's birthday so Curried Mussels and Pomme Frites became his birthday dinner. He couldn't have been happier, and I always forget that making mussels for dinner is truly the simplest meal to make, as long as you buy the mussels cleaned. 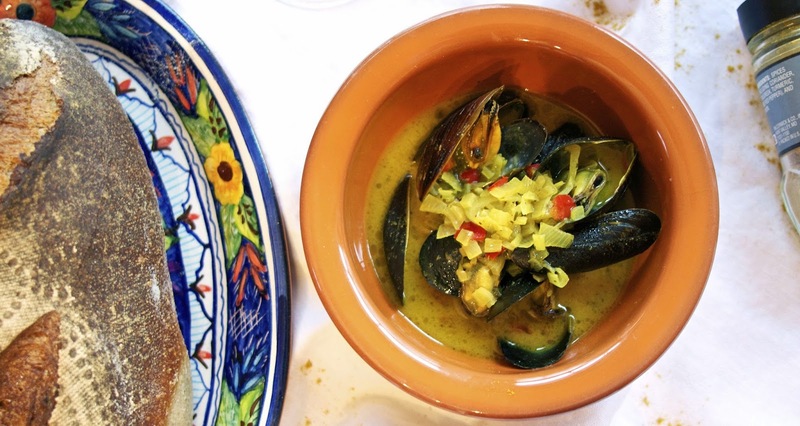 I never ate curried mussels and I assumed that they were going to be spicy, which seemed unusual for French Fridays because we have all learned that the French are not into spicy food. The recipe has spicy elements: a chile pepper and curry powder, but their fire is diminished by heavy cream, and putting the pepper in whole and removing it after cooking. I decided to keep the fire stoked by adding more curry powder, substituting chicken broth for most of the cream, and chopping up the chile pepper and putting the pieces into the broth. I also thought that cilantro goes better with curry than parsley, so I substituted it. The result was a super warming and flavorful broth that we all sipped and dipped bread into. My kids loved that it had kick (a teenager thing). I doubled the broth and had some left over, which I will add rice noodles to for a lunch time soup. 1) In a large sauce pan or dutch oven melt the butter on medium high heat. 2) Saute the shallots and onion until they are soft then add: chile pepper, curry powder, thyme, salt and pepper. Mix around for about a minute to bloom the seasoning. 3) Add the white wine and bring to a boil. Stir and let it boil for a good minute. Then add the chicken broth. 4) Once the chicken broth and wine come to a boil add the mussels. Mix them up and cover them with a lid. Let them steam for 4 minutes. Check that most have opened; if not cover for another minute or two. 5) When mussels have opened. Add the cilantro and as much cream as suits your taste. The more you put in the less spicy the broth will be. 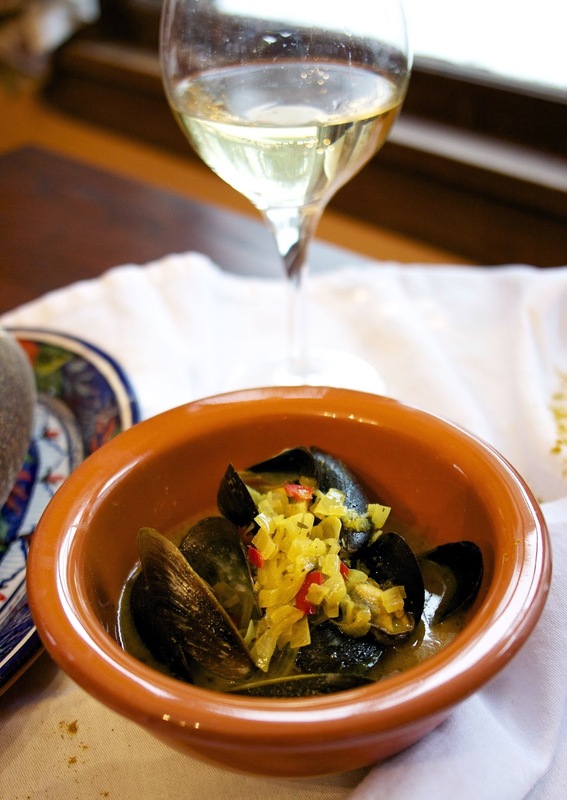 Mix well with the mussels and serve immediately. Great with french fries and a hearty bread for dipping. How funny Diane…I also reminisced about being in Holland, sitting at an outdoor bistro eating mussels!! Yours look fabulous…needless to say a big hit in my house too! We just don't have mussel places in the US. I grew up on the coast and clams are much bigger. Yes, buying clean mussels really is key! I could only find an uncleaned batch for one of the FFwD recipes and it took me almost an hour to get the darn things cleaned up. I vowed never again. It seems that all of the places around here sell them cleaned which never was the case in the past. It is probably the only way they can get anyone to buy them. Sounds and looks great, Diane! I wish I'd bought already-cleaned mussels. Ah, well. This recipe reminded me of BC times as well (and even some BH--before husband--times). What a fun read! I can't even remember BH times anymore we have been a couple for 25 years. But I love when foods connect you to a time and place. Jim and I had mussels in Brussels topped off with a Belgium waffle filled with ice cream and he became sick as a dog. My husband was so ill from mussels once in London that we almost had to cancel our flight home, but that hasn't kept him from them...we just watch what country we eat them in. Great idea to double the broth and use for soup! Sounds like your husband had a great birthday! The last time we made mussels I remembered that there wasn't enough broth. This particular broth worked really well as soup. What a wonderful "mussels" memory! Happy Birthday tome hubs. Thanks it was a snow day too so my husband got to play board games with the kids too. Dear Diane, a very Happy Belated Birthday to your husband! What a wonderful idea to be serving these as his birthday dinner! Your Curried Mussels look perfect with all that lovely creamy sauce and the nice bread for moping it up. Thanks so much Andrea... my husband made the bread too.. so it was extra special to dip. This was good, and it is fabulous that it reminds your husband of a happy trip. The chicken stock substitution appeals to me because it would also reduce the calorie count on this delicious dish. I did think about that too... it worked really well. Just a little cream for flavor is all it really needs. My thoughts were a little closer to home - I can't eat mussels (or clams) without thinking about digging for crayfish near the lake I grew up on. Sounds like a lovely meal! Thanks a sweet memory. We used to dig up steamers on the beach in CT when I was kid. Nothing like collecting your own shellfish. I like your adaptions and changes, Diane, but especially think that making extra curried broth and using it with rice noodles is a great idea. I am trying to get away from making sandwiches for lunch and noodles in something is a great idea. I am a beer drinker and I remember when we could first buy Chimay in the United States (Colorado). Those monks had kept it to themselves and their European customers prior to that. I think it now has to be altered to be less potent to be sold in the United States. (Buy it in Mexico) So, when you retire to Colorado (and, I encourage you to do that), you will not be able to buy "real" Trappist beer here but you will be able to buy Pot. Just sayin'. Making extra broth was an excellent idea! This one was very flavorful and I like the changes you made. What a lovely birthday dinner for your husband. How nice that you have a beautiful trip to remember! Thanks Guyla It is great that a food can bring up a strong memory.... taste and smell, very powerful memory triggers. Sounds like this was a hit with the whole family. I wished I had a love for mussels. I am inspired to make this with shrimp. Shrimp and clams are the better first step into shellfish. Mussel can be a bit chewy. Welcome to the blogspere.. I will go check out your site. Oh my goodness, this sounds delicious...I had never thought to use curry powder with mussels...can't wait to try it. Have a wonderful weekend, Diane. What a lovely birthday supper! I've never had mussels prepared this way but it makes a tasty change from a typical white wine sauce! Also love how you refer to BC as 'before children', Diane - that made me smile :-) Thank you for being a part of the Hearth and Soul hop. Yes, we all have those fond BC memories. 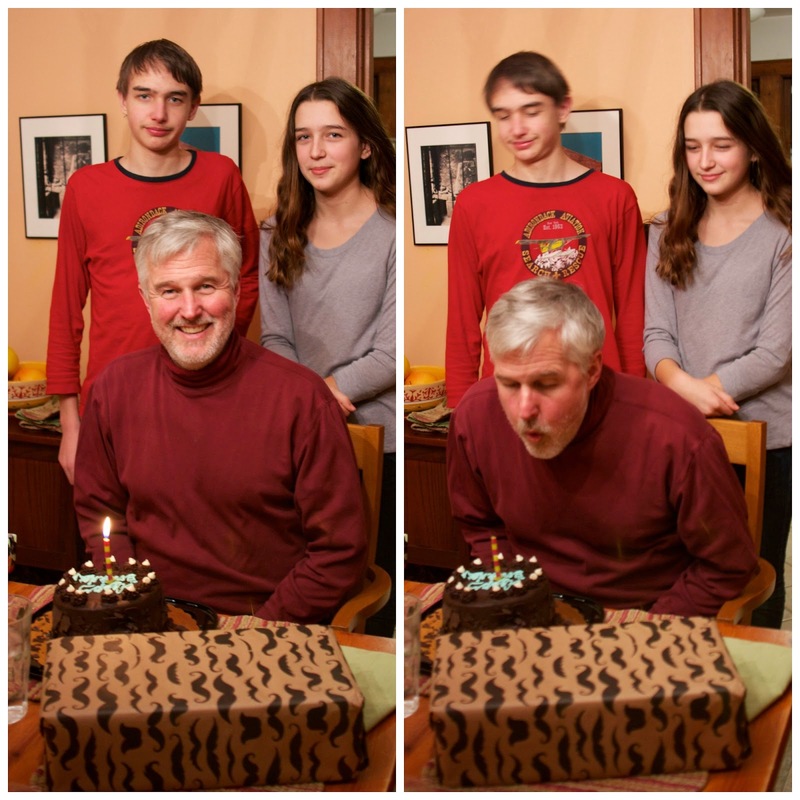 Happy Birthday to your husband, looks like a great time with awesome food! Thanks so much for sharing with Full Plate Thursday and have a great week. Thanks Miz Helen he had a great time. One of these days I will have to try Mussels - shells tend to intimidate me when cooking. What a nice family you have! They are lucky to have such a great cooker at home, I'm jealous, you won't serve me a plate of these appetizing curried mussels! Thanks so much I am truly blessed.